The M26 fragmentation grenade entered service with the United States military in the early 1950s, seeing widespread combat use through the end of the Vietnam War. 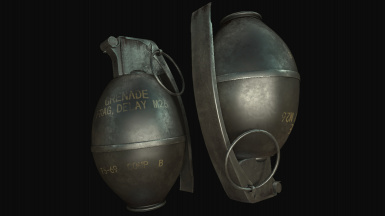 The grenade was designed to replace the aging Mk.II "Pineapple" grenade used extensively in World War II. The M26 and its variants use a filler charge of Composition B, a mixture of cyclotrimethylenetrinitramine (RDX) and trinitrotoluene (TNT) explosives. The paraffin wax-stabilised RDX in Composition B is considerably more stable and less prone to shock detonation than the flaked TNT filler of the Mk. 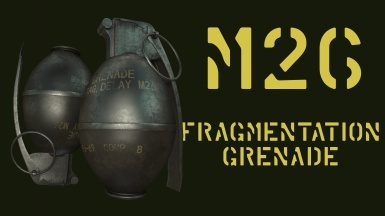 II grenade, and the M26's M204A1 fuse does not spark, smoke, or fizz, unlike the Mk. II. Also unlike the Mk. II, the M26 has an internal notched steel fragmentation coil, compared to the Mk. II's external pineapple shaped body. 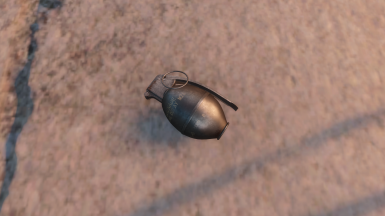 Thus, the individual shrapnel projectiles created by the M26 are a bit smaller than those of its predecessor. 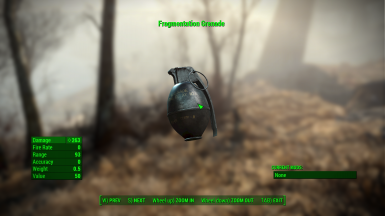 This mod does not alter the properties of the vanilla frag grenade in any way. It only replaces the model and textures. 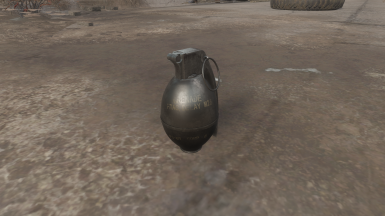 Unlike the vanilla grenade model, the spoon is actually removed when it is thrown. 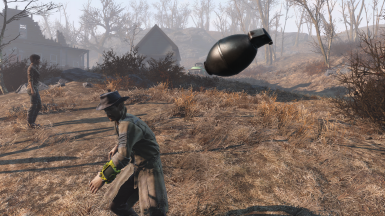 To install the mod, simply extract the folder labeled "Data" into your Fallout 4 main directory, and select the option to replace all files if necessary. Or, you could use a Mod Manager. Meshes and textures by TactaGhoul.